A three-part story inspired by Wagner’s classic opera The Ring of the Nibelung. Siegfried, half-god and half-mortal, is a young boy being raised by Mime, one of the last of the dwarf-goblin Nibelungs, in a dark forest with only wolves for friends and family. While his foster parent only wants to live in peace and solitude, Siegfried yearns to discover who his real parents are and live amongst his own kind, not knowing that Odin, father of the Norse gods, has a destiny planned for him: to fight the dragon Fafnir, guardian of the Rheingold. Siegfried was fantastic on every level. The adaptation of the myth was excellent. The Art work is STUNNING and you feel for all the characters even the wolves! This is part of a trilogy, and unfortunately it’s being translated from German so English readers are gonna have to be patient… but it’s so worth it! Everyone who considers themselves a mythology fan or a graphic novel buff should be ashamed if they don’t at least pick this up and give it a try. Also Kudos Netgalley I could actually read everything this time and the imagine quality was superb! 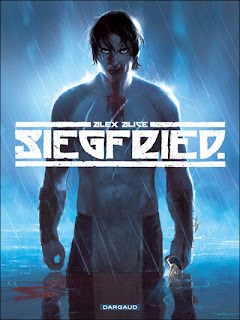 This entry was posted in Uncategorized and tagged alex alice, art, book, books, dargaud, fantastic, graphic novel, norse, norse myths, review, reviews, siegfried, wow.